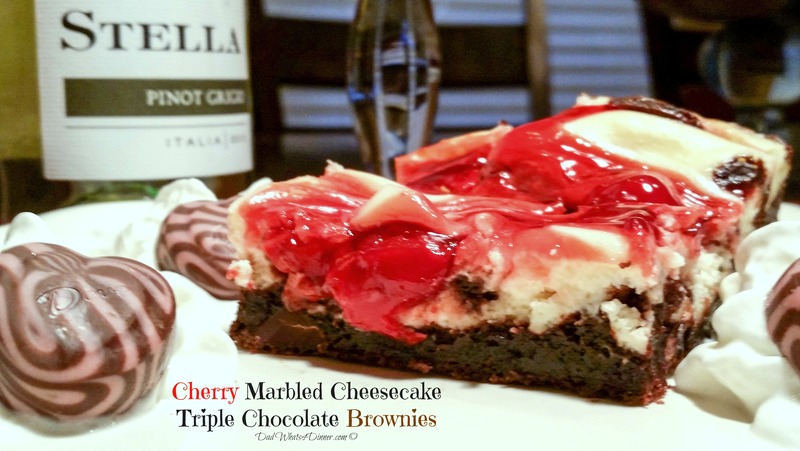 These Cherry Marbled Cheesecake Triple Chocolate Brownies are divinely decadent and perfect for Valentines Day! 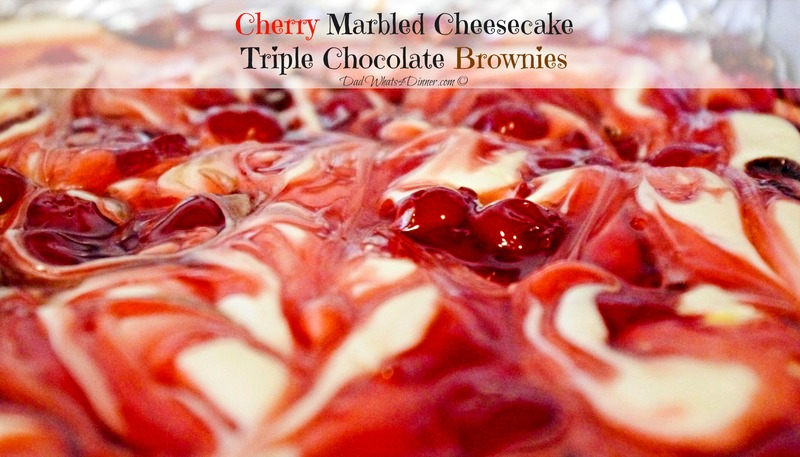 Luscious chocolate brownie swirled with cheesecake and cherry pie filling. 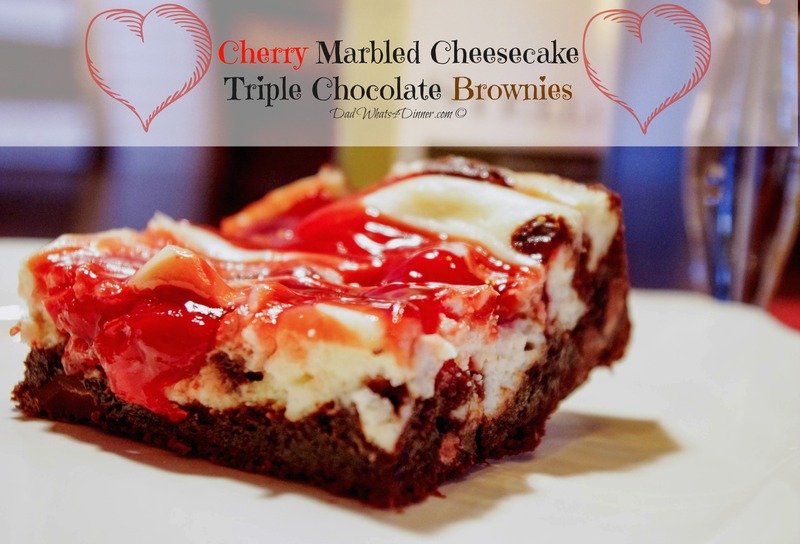 In honor of Valentine’s Day, I created these Cherry Marbled Cheesecake Triple Chocolate Brownies that even a husband could make to please his wife. I came up with this idea last Sunday in church. Christie, my wife, said I should be paying more attention. I said it was divine intervention. When I got home I started researching recipes. My recipe was inspired by “Parsley” on Food.com This brownie is very easy to make using Ghiradelli Triple Chocolate Brownie Mix. We buy the industrial size box of brownies, from Costco, to keep on hand. 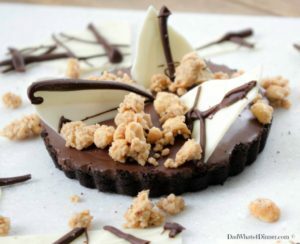 Great for a last-minute dessert or for the kids to take to a school function. The brownies are simple to make. Follow the package directions to mix up the brownies. Add the cream cheese and top with the cherries. Use a knife to make the swirl and bake. It is essential to let the Cherry Marbled Cheesecake Triple Chocolate Brownies chill in the fridge for several hours before cutting. Cut the brownies and place individual servings into small cupcake cups. 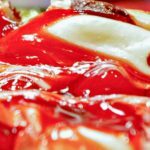 I also posted an easy Valentine’s day dinner which all husbands can make for their significant other. Ladies show him the recipe and let him create a special dinner for you. But don’t let him be like me and have you clean up. Christie loves my food but dreads the mess. Enjoy and Happy Valentine’s Day!!! 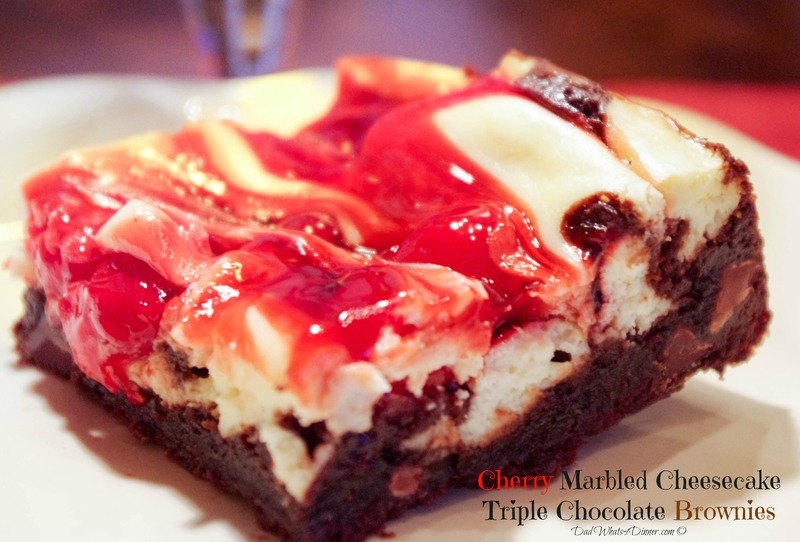 Your Valentine will go crazy for these Cherry Marbled Cheesecake Triple Chocolate Brownies! 2 8 oz . packages cream cheese. I used low-fat cream cheese and it worked fine. Line a 13 x 9" baking pan with foil, letting ends extend a bit over sides. Coat the foil with nonstick cooking spray. Mix oil, water and egg in large bowl. Add package of dry brownie mix. Stir until moistened. Do not over mix. If using a different brownie prepare according to package directions. Drop heaping tbsp. of topping mixture on top of brownie mixture. Scatter cherry pie filling over top of cheesecake topping mix. Run tip of a knife through topping and pie filling to create a marbleized look. Bake at 350° for 45-55 minutes or until brownie edges begin to pull away from sides and edges of cream cheese are slightly brown. The center will not look set even when done. Cool in pan on wire rack. When cooled, chill for at least 3-5 hours in refrigerator before cutting. When chilled, lift out brownies using foil, onto cutting board. Carefully remove foil. If foil does not release cut brownies into individual pieces then remove foil. Total Time does not including bars chilling in the fridge for 3-4 hours. A nice tasty marbling going on in those brownies. Thanks for sharing with FF! OH.MY.STARS! This lovely dessert is SCREAMING my name! I’m wild about cream cheese…mix it with chocolate and I’m on it. Thanks a million for sharing with us at Weekend Potluck. You are an amazing cook, hubby and dad! Not sure about all that, but I try. Thanks for hosting and have a great weekend. “Divine intervention,” I like the way you think! These look amazing. They remind me of a black forest cake in brownie form! Pretty close. Yeah not sure how that comment went over with my wife. Thanks for stopping by. You must have been very hungry in church to get such an inspiration, but I’m sure hunger or cravings are the source of many a fine recipe. This does look excellent! Thanks for sharing with us at FF. Thanks Hilda and Happy FF! Sometimes those inspirations come in the middle of the night. I have a weird foodie brain. Haha. I know what you mean. 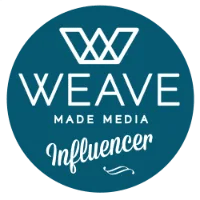 I think that comes in part from writing a food blog – the brain never rests. Happy FF to you too. I can feel that some people are excited for Valentine’s day because of these delicious-looking bars. These look really good, Quinn. 🙂 Happy FF104 & have a lovely weekend. Thanks Jhuls. Perfect for Valentine’s day. Happy FF! It looks beautiful! 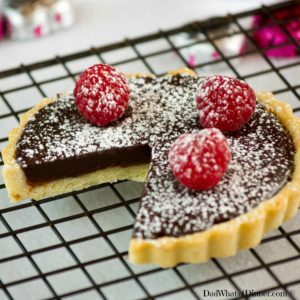 and really such a lovely recipe for Valentine Day! I say always yes to cherry-desserts! 😀 Yummy! Oh my goodness! These look amazing and combine 3 of my favorite flavors!! I might have to make these for my birthday coming up in a few weeks. Yum! Thanks Chrysta they are very tasty. Let me know how they turn out. Thanks for stopping by and have a great weekend. Quinn, these look amazing! 😮 I bet your wife LOVED them. I’m going to have to check out your V-Day dinner for my hubby. Thanks for the great ideas! She did like them and the dinner also. Have a great weekend. This definitely looks like divine intervention to me! Yummy! Thanks Michelle. Perfect for Valentine’s day. Happy FF! It’s funny you mention the industrial size brownie mix from Costco, I buy the same thing. 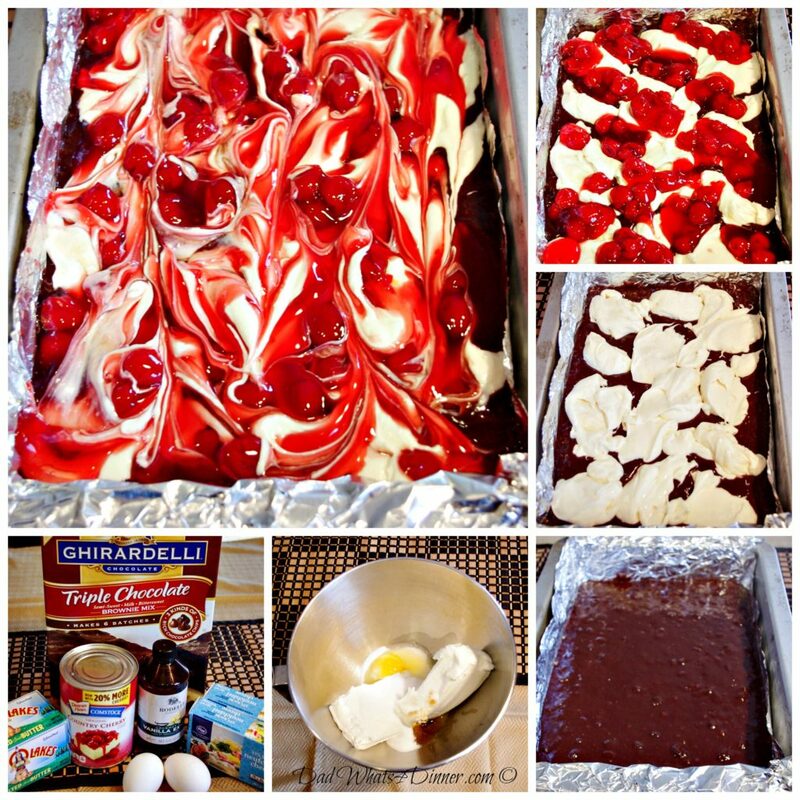 I think i’m going to make your cheesecake brownies for Superbowl this Sunday. Thanks for sharing and happy FF! Yeah we also buy the industrial size bag of semi sweet chocolate chips. If you make them let me know how they turn out. Happy FF! This looks great. I like the recipe. Very user friendly. Will save it. Have a great week! Quinn, I am drooling over your Marbled Cheesecake Triple Chocolate Brownies!! Thanks for sharing it here at FF! I too am a big fan of Costco for all my supplies! If it is available in Costco I don’t look for it anywhere else! Yum!! The marbling’s so pretty too!